Are you happy with your current home but maybe want to add some built-in audio/video or automation? In addition to new construction, Audio Addicts also offer options for existing homes. This process is called “retro fit”. Although this process is more labor intense, our clients can expect home audio and video systems comparable to new construction. 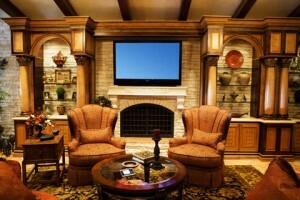 Audio Addicts offer home consultations so that we may assess the feasibility of each project. In many cases, we can achieve our desired clean look by retro in wiring through existing walls, using crawl spaces and attic spaces as access. Our creative and talented installation staff can turn what seems to be impossible into reality by generating innovative ways to complete the task. At this point, we provide the client with a professional proposal that clearly outlines all of our recommendations and pricing. Once the proposal is approved by the client, an appointment is set for the home installation. All electronics are installed at this time. Universal remotes, another way to simplify your home audio and video systems, are also programmed at this time. The system is then tested and re-tested until Audio Addicts staff is completely satisfied with all aspects of the project. Our last stage is when the customer is taught how to use the system. Audio Addicts have on-call employees, who are available for all of your questions. Audio Addicts staff are available for additional training if necessary. Minor tweaking may have to be done as you become more familiar with your system. To answer any questions or make any adjustments, Audio Addicts staff are always just a phone call away.